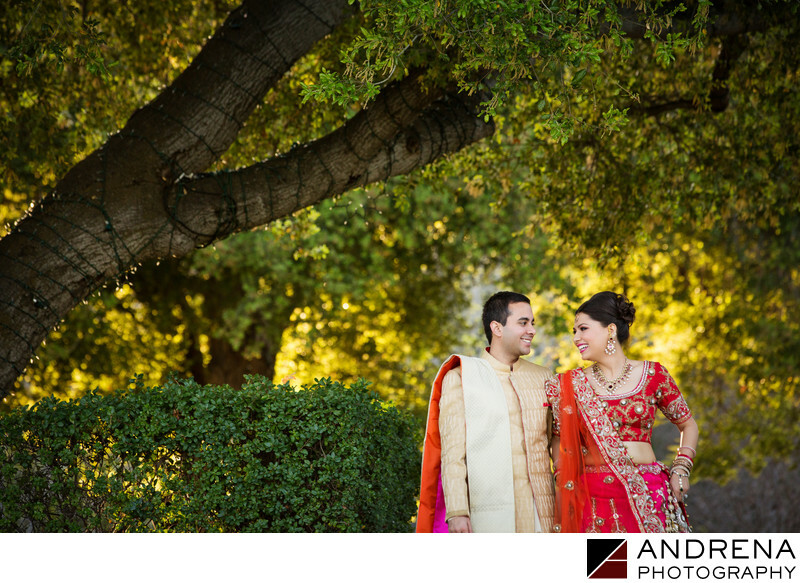 The Sherwood Country Club in Lake Sherwood is always a beautiful place to shoot, and it became even more beautiful when it was lit up by the dazzling red of this Indian wedding couple's red and gold outfits. I love positioning couples against beautiful late-afternoon light, especially when it shines through tree leaves to create different colors. The amber and gold hues created by the sun's rays make this image much more interesting than if the leaves had just been green. I also love the joy on this couple's faces. This event was coordinated by Neha Shah at Blue Lotus Insights. Indian wedding and reception photographed at the Sherwood Country Club in Lake Sherwood, California.